IRIAF Brig. 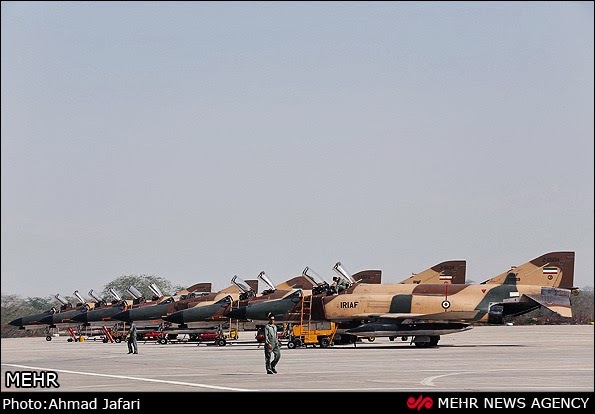 Gen. Hossein Chitforoush told reporters in Bandar Abbas today that the air force fighters have succeeded in missions during the second day of the Defenders of Velayat Sanctuary 4 exercises. F-4 Phantoms, Su-24s, F5s, F-1 Mirages, and Saeqeh (thunderbolt) fighters took part in today’s air drills. Chitforoush added that F-4 fighters destroyed mobile targets on sea, firing Maverick enhanced pinpointing rockets. Iranian Defense Ministry had announced last September that it had equipped F-4Es with Nasr and Qader anti-ship cruise missiles (ASCMs), with the range of 35km and 200km respectively. The F-4Es could test fire the ASCMs during the current exercise. UPDATE: Iran media reports a Qadr air-launched cruise missile as previously seen fitted to F-4E Phantom II was successfully fired during the second day of the exercise. Success versus mock targets... anytime Hossein, anytime... Yaaawn! The fact that filthy akhoonds and bacheh akhoonds living comfortably in the u.s. (with money stolen from Iran) would send a poor talented pilot into battle with these aged decrepit pieces of garbage, against F15 and even F22s! shows you their evil. Reminds of me of when the same sent young boys to clear mine fields in the Iraq war. The imprudent lack of foresight on part of the moronic clerics have ushered in this great disparity between Iran's airforce and that of Saudi Arabia, UAE, Kuwait, Qatar etc. Their strategy of alienating the US, openly taking a hostile stance towards the West, is what has caused the present demise of the Iranian military. I reckon these obsolete jets will be no more than a temporary nuisance to USAF & USN fliers. The religious rulers in Tehran have indeed put the Iranian people in great peril by mismanaging the country from day one. Gurney, another troll with nothing relevant to post. "Yaaawn!" Another junk comment with no relevance, from the troll Anonymous December 21, 2013 at 5:12 PM. http://www.liveleak.com/view?i=ad6_1387769260 --- Saudi armed force demonstrate their impressive firepower. The proof of "relevance" is the decrepit pieces of junk shown in photo's above,Anonymous troll 7:06 AM. Anon 3:30 PM, proving Anon 7:06 AM correct once more. And so it's mock targets, it is the purpose of a drill, everyone does it that way, what's the problem ? "Success" here means they tested the efficiency of their systems and validated their tactics. Here lies the very interest of a military drill. Do countries have to create real war for themselves every time they want to train their troops and claim success in doing so ? NATO does it, Russia, China, India do it, basically any country having an army does it, so why not Iran ? why is not always different and becomes absurd when it comes to Iran ? The principle of a drill is that it is not a real combat situation with live targets. Do you take real people and kill them as targets whenever you want to do some shooting practice Gurney ? A troll indeed, Anon 7:03 is right. Next thing you know you're going to ask why Iranian firefighters still rely on outdated water pumps to put out fires, or why their vehicles still use primitive wheels and don't hover over the ground like in "Back to the Future" (a great movie btw). Proving that he like you are a junky. Anonymous December 24, 2013 at 8:48 PM, demonstrating the limit of technical knowledge and debating ability, possessed by anti-Iran people here.